oven-baked goodness on your favorite devices. Want pizza? Google Home makes it easy. Just say, “Ok Google, talk to Domino’s,” and you can build a new order from scratch, place your Easy Order, reorder your most recent Domino’s order, and track your order using Domino’s Tracker®. That’s what we’re talking about. Amazon Alexa can hear your voice from across the room. That means you don’t even have to get up to order Domino’s. With the Domino’s Skill for Amazon Alexa you can build a new order, reorder your most recent order, place your Easy Order, or track an order using Domino’s Tracker®. The future is now. Slack lets you collaborate with your team all in one easy application. And now you can even use Slack to order pizza for your team. Start a new order, reorder your most recent order, or place your Easy Order. Doesn’t get easier than that, you Slack-er you. Facebook isn’t just for liking your friends’ witty posts and cat videos anymore. Now you can build a new order from scratch, reorder your most recent Domino’s order, place your Easy Order, and track your order using Domino’s Tracker®, all within Messenger. How do you like that? It seems you can get almost anything with a single click these days. But we thought that was one too many. Simply open the Domino’s Zero Click app and, after a 10-second countdown, your Easy Order will automatically be placed. Zero clicks needed. It’s easy. Maybe too easy. You’ve been warned. While the Emoji is most commonly known for its bizarrely wide range of facial expressions, there is one in particular we love most, the pizza slice. And if you have an Easy Order, now you can order Domino’s by simply texting with it. We spend a lot of time in our car. Maybe too much. Running errands, driving to and from work, dropping off the kids, and who knows what else. But if you have a Ford with SYNC® AppLink™, you can put that time to good use and order dinner on the way home. Some say we’re living in the new Golden Age of television. Well, now it’s official. With the Domino’s app for Samsung Smart TVs you can reorder one of your recent orders, place your Easy Order, or track an order using Domino’s Tracker®, without ever missing a moment of your favorite show, sport, or scene. Sometimes you just want to use that beautiful speaking voice of yours. That’s why we’ve created Dom, an order-taking expert that lives in the Domino’s app for Android™ and iPhone®, and hangs on your every word. Make sure you’re readyto take advantage of them. Let's not forget about the one that started it all, Dominos.com. It may not be an app or ordering with a TV, but it still has some serious skill. Place your Easy Order from your personalized homepage in as little as five clicks. 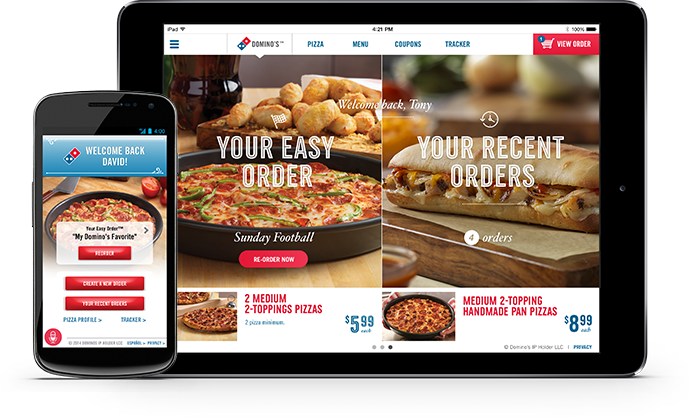 It's super fast to place your Easy Order on the Domino's app for iPad® and Domino's mobile apps too. When you're signed in, just tap REORDER on your personalized homepage, and a few taps later your order is headed for the oven. What’s a Pizza Profile and how do I create one? With a Pizza Profile, you can save all your personal information, like your address and your credit card, so it’s easier and faster to order next time. To create your Pizza Profile just click here to get started at Dominos.com. Simply fill-out the form, click “CREATE YOUR PROFILE” then save any additional information you want to on the next page. What’s an easy order and how do I create one? An Easy Order is your favorite Domino’s order, how you want to get it (Delivery or Carry out), your payment information, and your address, all saved together so you can order it with just a few clicks or taps with any of the Domino's AnyWare™ devices. To save an Easy Order, if you have a Pizza Profile and a Recent Order, simply click "SAVE AS EASY ORDER” on the homepage of Dominos.com. If you’re just getting started, you’ll need to place your favorite order. During the checkout process click "Save this order as your Easy Order” just before you click "PLACE YOUR ORDER." This will save your Easy Order for the next time you order with any of the Domino’s AnyWare™ devices. How can I create an Easy Order without placing a new order? You can save a Recent Order as an Easy Order, just select "SAVE AS EASY ORDER." If you do not have a Recent Order, you will need to place a new order to save as an Easy Order. Do I need to have a Domino’s app specifically for Google Home? Yes, you need to have the Google Home app on your mobile device. Then sign in to and enable the Domino’s action within the Google Home app. How do I enable the Domino’s action on the Home app? You authorize the action by signing into your Pizza Profile to place your Easy Order or most recent order. You can also track an order that was placed with your Pizza Profile. Do I have to have a Pizza Profile to use Google Home? Yes, you do have to have a pizza profile to build a full order from scratch, place an Easy Order or recent order and track your order with Google Home. How do I place an Order with Google Home? Can I use more than one phone number to track? No. Currently, if you have a Pizza Profile, Google Home will track orders by the phone number tied to your profile or your most recent order. Can I order anything else other than my Easy Order? Yes. If you have a Pizza Profile you can also order your most recent order. Why can’t Google Home find my order to track? There may be up to a minute delay from the time your order is placed to being able to track it using Google Home. Can I edit my Easy Order with Google Home? No, you will need to update your Easy Order by placing a new order using Dominos.com or the Domino’s app on your mobile device. Can I place a future order with Google Home? No, your order cannot be scheduled for a future time. Can I use a gift card as the method of payment for my Easy Order and place my order using Google Home? No, users with an Easy Order with a gift card as their payment method cannot order using Google Home. Can I use a coupon with my order placed with Google Home? Yes, orders with a valid coupon will be placed with the discount applied. Any orders placed with an invalid or expired coupon will be processed at menu price. Be sure to review your total before confirming your order. Do I need to have a Domino's App specifically for Amazon Echo? Yes, you need to have the Alexa app on your mobile device. Then, enable the Domino's skill on the Alexa app. How do I enable the Domino's skill on the Alexa app? You authorize the skill by opening the Alexa app, enabling the Domino’s skill and linking your information for placing and tracking orders. Do I have to have a Pizza Profile to use Amazon Echo? No, you can track your order by enabling the Alexa skill with the phone number you used to place your order. However, in order to place your Easy Order or most recent order with Alexa, you will need a Pizza Profile. How do I place an order with Amazon Echo? Make sure you have authorized the Domino's skill in the Alexa app by signing into your Pizza Profile and have an Easy Order or recent order saved. Then, say "Alexa, open Domino’s." Make sure you have authorized the Domino's skill in the Alexa app using the same phone number you used to place your order. Say "Alexa, open Domino's and track my order." No. You can only use one phone number to authorize Alexa. If you have a Pizza Profile, Amazon Echo will track orders by the phone number on your most recent order. How do I change my phone number for tracking? If you have enabled the Alexa app using your phone number, you must disable the skill, then enable it again with the new phone number. Why can't Amazon Echo find my order to track? There may be up to a minute delay from the time your order is placed to being able to be track it using Amazon Echo. Can I edit my Easy Order with Amazon Echo? No. you will need to update your Easy Order by placing a new order using Dominos.com or the Domino's app on your mobile device. Can I place a future order Easy Order with Amazon Echo? Can I use a gift card as the method of payment for my Easy Order and place my order using Amazon Echo? No, users with an Easy Order with a gift card as their payment method cannot order using Amazon Echo. Can I use a coupon with my order placed with Alexa? Yes, orders with a valid coupon will be placed with the discount applied. Any orders placed with an invalid or expired coupon will be processed at menu price. Be sure to review your order total before confirming your order. Do I need a Domino's App specifically for Slack? Yes, you need to connect the Domino’s app for Slack to your Slack team. Once it’s been added, you can @mention Domino’s to start a conversation and build an order with Domino's. How do I enable the Domino's App in Slack? To enable the Domino’s experience, go to the Slack app directory and search for Domino’s. Then you simply authorize or connect the app to your Slack team. Do I need to have a Pizza Profile to use Slack? No, you can build a full order from scratch and track your order without authenticating and signing in to your profile. To place an Easy Order or most recent order through Slack, you will need a Pizza Profile. How do I place an order with Slack? Make sure you have connected the Domino’s app through the Slack app directory. To start a group order, @mention Domino’s in your Slack channel and start chatting with Dom, who will help you build and place your order. You can also direct message @Dominos to sign in to your Pizza Profile and securely place your Easy Order or recent order. To track your order, @mention or direct message @Dominos and ask to track your order. Yes. Dom will ask you what phone number you used for the order that you’d like to track. Why can't Slack find my order to track? There may be up to a minute delay from the time your order is placed to being able to track it. Can I edit my Easy Order with Slack? To adjust items saved to your Easy Order, place a new order using dominos.com or the Domino’s app on your mobile device, and save the changes to your Easy Order. Can I place a future or timed order with Slack? Can I use a gift card to pay for my order using Slack? Carryout orders can pay with any form of payment accepted at the store. Guest orders will be given the option to follow a secure link to dominos.com, where they can place their order using their preferred payment method. Can I use a coupon for my order placed through Slack? Yes, reorders with a valid coupon will be placed with the discount applied. Any reorders placed with an invalid or expired coupon will be processed at menu price. Be sure to review your total before confirming your order. You can also ask Domino's for a coupon on new orders. An Easy Order is your favorite Domino’s order, how you want to get it (Delivery or Carry out), your payment information, and your address, all saved together so you can order it with just a few clicks or taps with any of the Domino's AnyWare™ devices. To save an Easy Order, if you have a Pizza Profile and a Recent Order, simply click "SAVE AS EASY ORDER” on the homepage of Dominos.com. If you’re just getting started, you’ll need to sign in to your Pizza Profile and place your favorite order. After checkout, click “Save as Easy Order” on the Domino’s Tracker page. This will save your Easy Order for the next time you order with any of the Domino’s AnyWare™ devices. DO I NEED A FACEBOOK ACCOUNT TO ORDER THROUGH THE FACEBOOK MESSENGER APP? Yes, you will need to create a Facebook account to use Facebook Messenger. CAN I EDIT MY EASY ORDER OR PLACE A CUSTOM ORDER IN FACEBOOK MESSENGER? While you cannot edit your Easy Order, you can place a new custom order in Facebook Messenger. DO I HAVE TO LIKE DOMINO’S ON FACEBOOK TO ORDER THROUGH FACEBOOK MESSENGER? No, you do not have to like Domino’s on Facebook to order through Facebook Messenger. Yes, you can place a new custom order, reorder your most recent order or place your Easy Order with Facebook Messenger. CAN I USE A GIFT CARD AS THE METHOD OF PAYMENT FOR MY EASY ORDER AND PLACE MY ORDER USING FACEBOOK MESSENGER? No, users with an Easy Order with a gift card as their payment method cannot order using Facebook Messenger. CAN I USE A COUPON WITH MY EASY ORDER PLACED WITH FACEBOOK MESSENGER? Yes, orders with a valid coupon will be placed with the discount applied. Any orders placed with an invalid or expired coupon will be processed at menu price. When building a new order, you can request a coupon from Dom. Please be sure to review your order total before confirming. An Easy Order is your favorite Domino’s order, how you want to get it (Delivery or Carry out), your payment information, and your address, all saved together so you can order it with just a few clicks or taps with any of the Domino's AnyWare™ devices. To save an Easy Order, if you have a Pizza Profile and a Recent Order, simply click "SAVE AS EASY ORDER” on the homepage of Dominos.com. If you’re just getting started, you’ll need to sign in to your Pizza Profile and place your favorite order. 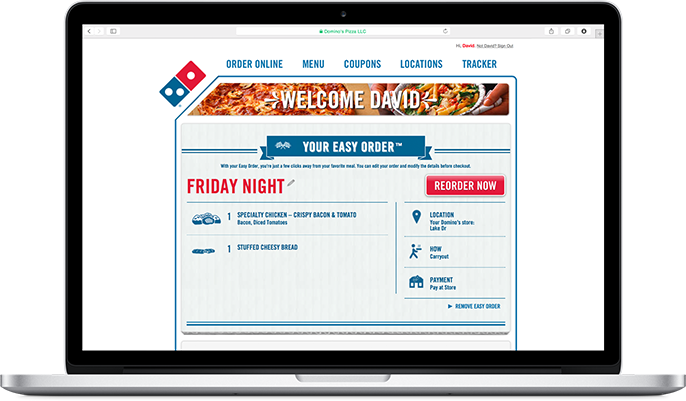 After checkout, click “Save as Easy Order” on the Domino’s Tracker page. This will save your Easy Order for the next time you order with any of the Domino’s AnyWareTM devices. WHAT DO YOU MEAN BY “ZERO CLICK”? Once you open the app, you’ll have 10 seconds before your Easy Order is placed. Don’t worry, you can pause the timer and review your Easy Order details just in case you’re not quite ready. When you’re ready, un-pause the timer and let it reach zero to place your Easy Order. WHAT IF I CLOSE OR LEAVE THE APP WHILE THE COUNTDOWN TIMER IS ACTIVE? If you close or leave the app before the timer reaches 00:00:00, your order will not be placed. Once you return to the app, the timer will be reset and you will have 10 seconds before your order is placed. DO I NEED THE DOMINO’S APP INSTALLED? You do not need the Domino’s app installed, however, it may make it easier to resolve any problems that occur with your order. CAN I EDIT MY EASY ORDER USING THE Zero click ordering app? No, you will need to update your Easy Order using the Domino’s app on your Android/iPhone, or at Dominos.com. Currently you can only order your Easy Order in the Zero Click Ordering app. CAN I PLACE MY EASY ORDER USING THE SHOPRUNNER DISCOUNT WITH THE ZERO CLICK ORDERING APP? No, users that use ShopRunner on Dominos.com will not be able to apply the ShopRunner discount when placing an Easy Order using the Zero Click Ordering app. CAN I USE A GIFT CARD AS THE METHOD OF PAYMENT FOR MY EASY ORDER AND PLACE MY ORDER USING THE ZERO CLICK ORDERING APP? No, users with an Easy Order with a gift card as their payment method cannot order using the Zero Click Ordering app. CAN I USE A COUPON WITH MY EASY ORDER PLACED WITH THE ZERO CLICK ORDERING APP? Yes, orders with a valid coupon will be placed with the discount applied. Any orders placed with an invalid or expired coupon will be processed at menu price. Please be sure to review your order total before confirming. What's a Pizza Profile and how do I create one? What's an Easy Order and how do I create one? An Easy Order is your favorite Domino's order, how you want to get it (Delivery or Carryout), your payment information, and your address, all saved together so you can order it with just a few clicks or taps with any of the Domino’s AnyWare™ devices. To save an Easy Order, if you have a Pizza Profile and a Recent Order, simply click "SAVE AS EASY ORDER" on the homepage of Dominos.com. If you're just getting started, you'll need to place your favorite order. During the checkout process click "Save this order as your Easy Order" just before you click "PLACE YOUR ORDER." This will save your Easy Order for the next time you order with any of the Domino’s AnyWare™ devices. Can other key words be used to place my Easy Order via text? At this time, only the keyword “Easy Order” can be used to place your order via text. What happens if I do not confirm my Text Order? If you do not confirm your order within 20 minutes, it will not be placed. If you reply after 20 minutes have passed, your order will not be placed. Yes, you can also send “RECENT ORDER” to place your most recent order. Can I change my Easy Order using Text Ordering? No, you cannot make changes to your Easy Order using Text Ordering. Can I use Text Ordering to place a future Easy Order? No, your Text order cannot be scheduled for a later time. Can I use a gift card as the method of payment for my Easy Order and place my order using Text Ordering? No, users with an Easy Order with a gift card as their payment method cannot order using Text Ordering. Can I use a coupon with my Easy Order placed with Text Ordering? You can save a Recent Order as an Easy Order, just select “SAVE AS EASY ORDER.” If you do not have a Recent Order, you will need to place a new order to save as an Easy Order. Can other hashtags be used to place my Easy Order via Tweet? At this time, only the hashtag #EasyOrder can be used to place your order via tweet. Will other people see my Tweet placing my Easy Order? Yes, users who follow @Dominos and you on Twitter can see that you have Tweeted #EasyOrder, but not the details of your Easy Order. What happens if I do not confirm my Tweet Order? If you do not confirm your order within 20 minutes, it will not be placed. Will Domino’s reply to me on Twitter® to confirm my Easy Order has been placed? Yes, Domino’s will send you a Direct Message on Twitter to confirm your order. Do I have to follow @Dominos to Tweet my Easy Order? Yes, you must follow @Dominos to place your Easy Order by Tweet. Users automatically follow @Dominos during the authorization process for Tweet Ordering. To keep ordering simple, you are only able to place your Easy Order using Tweet Ordering. Can I change my Easy Order using Tweet Ordering? No, you cannot make changes to your Easy Order using Tweet Ordering. Can users with a private Twitter account use Tweet Ordering? Due to technical requirements at this time, you must keep your Tweets public in order to use Tweet Ordering. Can I use Tweet Ordering to place a future Easy Order? No, your Tweet order cannot be scheduled for a later time. Can I place my Easy Order using the ShopRunner discount with Tweet Ordering? No, users that use ShopRunner on Dominos.com will not be able to apply the ShopRunner discount when placing an Easy Order using Tweet Ordering. Can I use a gift card as the method of payment for my Easy Order and place my order using Tweet Ordering? No, users with an Easy Order with a gift card as their payment method cannot order using Tweet Ordering. Can I use a coupon with my Easy Order placed with Tweet Ordering? What Ford® vehicles support ordering Domino’s with Ford SYNC voice-activated technology? To use the Domino’s app with Ford SYNC, you should check that your vehicle supports SYNC AppLink™. The Domino’s app does not currently work with SYNC with MyFord Touch®. Is there a Domino’s app specifically for Ford SYNC that I need to download? No, you can use the Domino’s app on your Android or iPhone mobile phone with SYNC AppLink. Why is my vehicle not recognizing my Easy Order command? You must be signed into your Pizza Profile on your mobile device’s Domino’s app and select “Remember Me” to use Ford SYNC AppLink. Can I edit my Easy Order using Ford SYNC AppLink? No, you will need to update your Easy Order using Dominos.com or the Domino’s app on your mobile device. Yes, using Ford SYNC AppLink you can place your Easy Order, re-order a Recent Order, or place a New Order by calling your local Domino's. Can I place my Easy Order using the ShopRunner discount with Ford SYNC AppLink? No, users that use ShopRunner on Dominos.com will not be able to apply the ShopRunner discount when placing an Easy Order using Ford SYNC AppLink. Can I use a gift card as the method of payment for my Easy Order and place my order using Ford SYNC AppLink? No, users with an Easy Order with a gift card as their payment method cannot order using Ford SYNC AppLink. Can I use a coupon with my Easy Order placed with Ford SYNC AppLink? Where can I download the Domino’s app for my Samsung Smart TV? You can download the Domino’s app for Samsung Smart TV using Samsung’s SmartHub. I don’t see the Domino’s App in SmartHub. Make sure your Samsung TV is a 2013 model or newer and has the latest update installed. Do I need to be signed into my Pizza Profile to track my order? No, you do not need to be signed into your Pizza Profile to track your order. Simply enter your phone number to start tracking an order you’ve already placed on another device. Can I change my Easy Order using the Samsung Smart TV app? Do I have to sign in every time I want to place an order? No, the app will keep you signed in for up to six months. But consider logging out of the app if the TV is shared with other users. Yes, with your Samsung Smart TV you can place your Easy Order or re-order a Recent Order. Can I place my Easy Order using the ShopRunner discount with Samsung Smart TV? No, users that use ShopRunner on Dominos.com will not be able to apply the ShopRunner discount when placing an Easy Order using Samsung Smart TV. Can I use a gift card as the method of payment for my Easy Order and place my order using Samsung Smart TV? No, users with an Easy Order with a gift card as their payment method cannot order using Samsung Smart TV. Can I use a coupon with my Easy Order placed with Samsung Smart TV? Do I have to have the Domino’s app on my mobile phone to use Voice Ordering? Yes, you must have the Domino’s app for Android or iPhone to use Voice Ordering. Yes, with Voice Ordering you can place your Easy Order, re-order a Recent Order, or place a new order. Can I use a gift card as the method of payment for my Easy Order and place my order using Voice Ordering? No, users with an Easy Order with a gift card as their payment method cannot order using Voice Ordering. Do I need to have the Domino’s app on my iPhone phone to use the Apple Watch app? Yes, you must download the Domino’s app onto your iPhone phone, and sign into your Pizza Profile. Do I need to download an app on my Apple Watch watch to order Domino’s? In order for the Domino’s app to show on your Apple Watch, you must select “Show App on Apple Watch” in the Domino’s settings of your Watch app. Can I edit my Easy Order using the Apple Watch app? No, you will need to update your Easy Order using the Domino’s app on your iPhone. What if I don’t see the Domino’s app on my Apple Watch? Make sure your Domino’s app is updated to the latest version on your iPhone, and that both the wearable and smartphone devices are up to date. Additionally, make sure you have selected "Show on Apple Watch" in the Domino’s settings of your Watch app. Currently you can only order your Easy Order on Apple Watch. Can I place my Easy Order using the ShopRunner discount with Apple Watch? No, users that use ShopRunner on Dominos.com will not be able to apply the ShopRunner discount when placing an Easy Order using Apple Watch. Can I use a gift card as the method of payment for my Easy Order and place my order using Apple Watch? No, users with an Easy Order with a gift card as their payment method cannot order using Apple Watch. Can I use a coupon with my Easy Order placed with Apple Watch? Yes, the order must have a valid coupon or it will not be placed. Do I need to have the Domino’s app on my Android phone or iPhone to use the Pebble smartwatch app? Yes, you must download the Domino’s app onto your Android phone or iPhone, and sign into your Pizza Profile. Do I need to download an app on my Pebble smartwatch to order Domino’s? Yes, you must download the Domino’s app for Pebble smartwatch onto your watch to place your Easy Order. Can I edit my Easy Order using the Pebble smartwatch app? No, you will need to update your Easy Order using the Domino’s app on your Android or iPhone smart phone. Yes, with Pebble smartwatch you can place your Easy Order or re-order a Recent Order. Can I place my Easy Order using the ShopRunner discount using Pebble Watch? No, users that use ShopRunner on Dominos.com will not be able to apply the ShopRunner discount when placing an Easy Order using Pebble Watch. Can I use a gift card as the method of payment for my Easy Order and place my order using Pebble Watch? No, users with an Easy Order with a gift card as their payment method cannot order using Pebble Watch. Can I use a coupon with my Easy Order placed with Pebble Watch? How do I create an Easy Order? Do I need to have the Domino’s app on my Android phone to use the Android Wear app? Yes, you must download the Domino’s app onto your Android phone, and sign into your Pizza Profile. Do I need to download an app on my Android Wear watch to order Domino’s? Yes, you must download the Domino’s app for Android Wear onto your watch to place your Easy Order. Can I edit my Easy Order using the Android Wear app? No, you will need to update your Easy Order using the Domino’s app on your Android smart phone. What if I don't see the Domino's app on my Android device? Make sure your Domino’s app is updated to the latest version on your Android smartphone, and that both the wearable and smartphone devices are up to date. 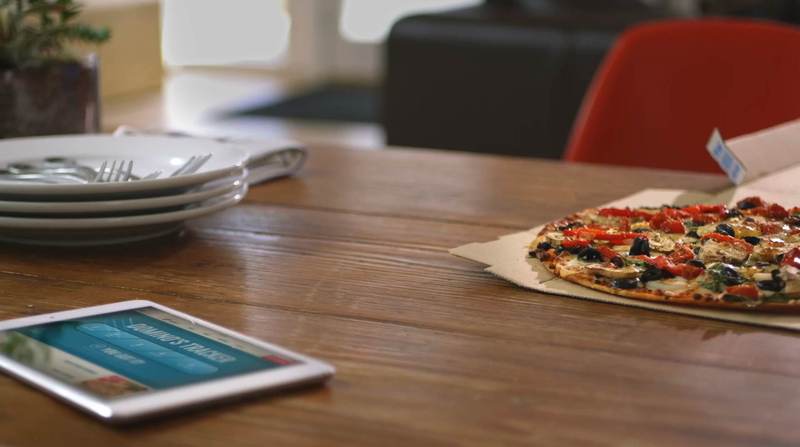 Does the Domino’s app work with other Android Wearables? Currently, the Domino’s Android Wear app only works with Android Wear compatible devices. Yes, with Android Wear you can place your Easy Order or re-order a Recent Order. Can I place my Easy Order using the ShopRunner discount with Android Wear? No, users that use ShopRunner on Dominos.com will not be able to apply the ShopRunner discount when placing an Easy Order using Android Wear. Can I use a gift card as the method of payment for my Easy Order and place my order using Android Wear? No, users with an Easy Order with a gift card as their payment method cannot order using Android Wear. Can I use a coupon with my Easy Order placed with Android Wear? Android is a trademark of Google Inc. Apple, the Apple logo and iPad are trademarks of Apple Inc., registered in the U.S. and other countries. App Store is a service mark of Apple Inc. *Ford SYNC AppLink is an optional feature. Don't drive while distracted. Even with voice commands, only use SYNC/other devices when safe. Not all features are compatible with all phones. SYNC AppLink is available on select vehicles and compatible with select smartphone platforms. SYNC AppLink is not compatible with MyFord Touch. Commands may vary by phone and AppLink software.